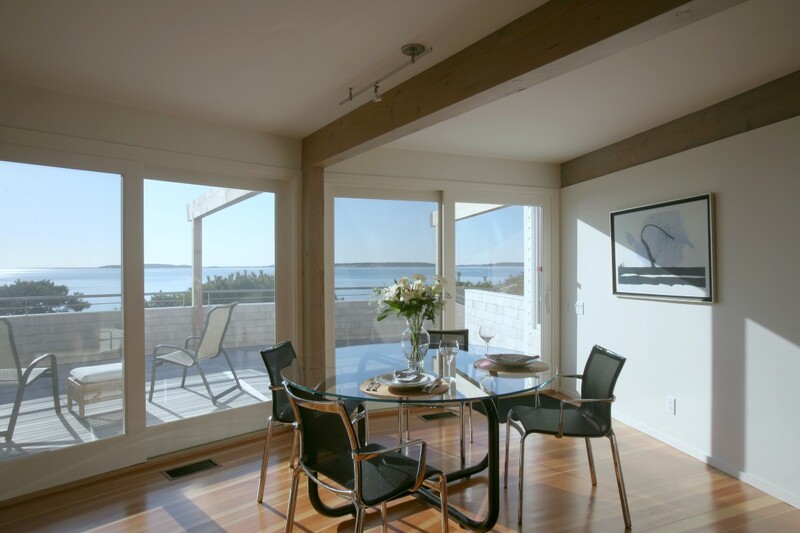 This project involved the reconstruction, reinterpretation, and redesign of a modernist style round house on a coastal bank overlooking Cape Cod Bay. 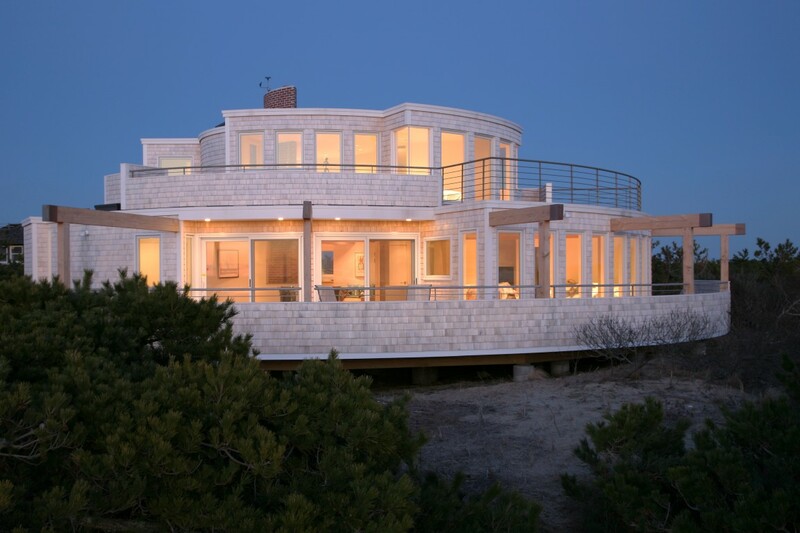 Built as a simple beach house in the 1970’s, the original house was designed by well-known Cape Cod designer, Charles Zehnder, as a series of concentric circles, clad in cement board sheets, painted white and referred to locally as the Wedding Cake House. In the redesign, we embraced the essential form and concept of concentric circles but overlapped that with the idea of waves projecting from a central point. The house touches down lightly on its site, standing on cylindrical concrete piers and a small octagonal service foundation. This allows the windblown sand of the coastal bank to move freely around the structure avoiding scouring and erosion. In the original house, there were no windows on the curved wall only sliders in rectilinear planes recessed back several feet from the outer walls. The windows are now grouped in bands on the south side of the structure and minimized on the north to allow for passive solar heat gain. 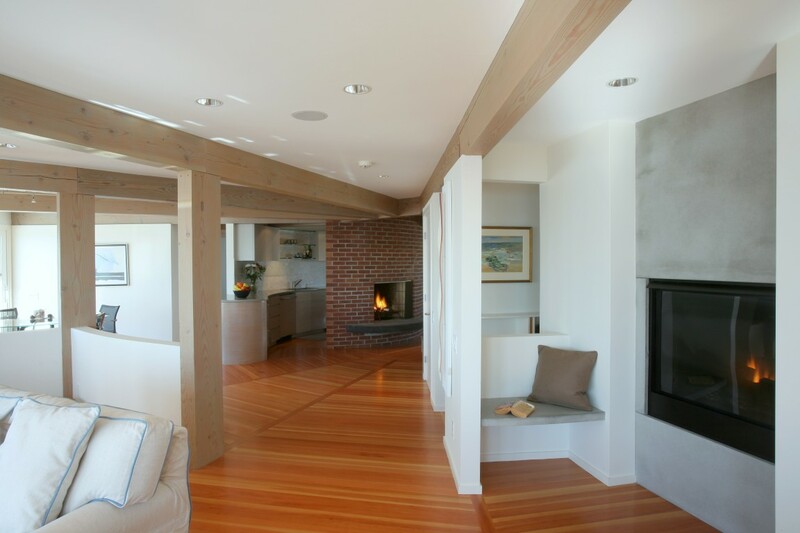 Exposed radiating fir beams and a fir floor that reflect the pattern of the beams overhead provide a strong definition of the form of the house. 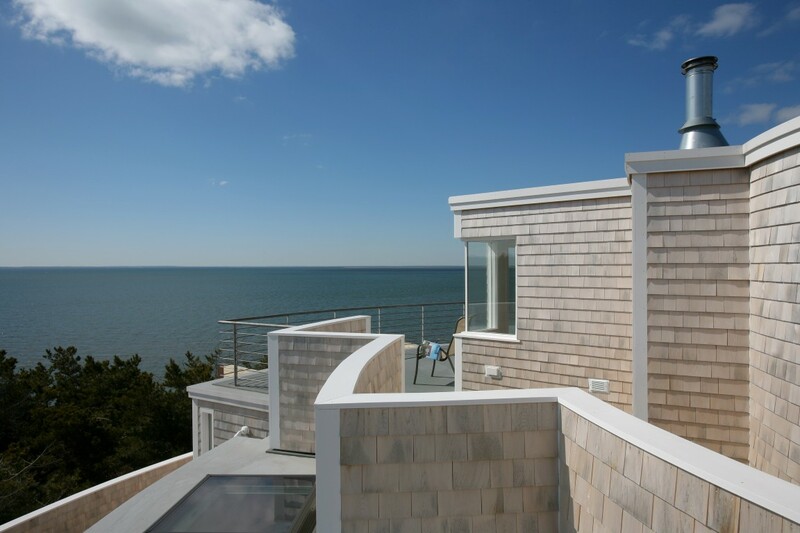 The superimposition of concentric circular walls defining the main circulation spaces and embracing the living spaces, intersected with half wall and full walls radiating out from a central point result in a lively interplay of light and shadow sheltered places and areas exposed to the spectacular view of Cape Cod Bay and Wellfleet Harbor. A redbrick chimney with a floating concrete hearth formed of two intersecting arcs and positioned just off center to the main axes, is all that remains of the original building. It acts a pivotal form for all the other spaces to revolve around. The planar picture windows are set back into the wall openings so as not to interrupt the continuous curve of the wall from the outside. The band of glass with light transparent corner enhances the sense of expansiveness and serenity. A half wall, concentric to the outside perimeter wall form a bedhead for the master bed and shelters the sleeping area from the rest of the Master bedroom suite. The second level is dedicated to a private master bedroom suite including a roof deck with sweeping views of Cape Cod Bay.